The wildlife bridge better connects north and south Cascades habitat. Traffic on Interstate 90 has been a barrier to wildlife. 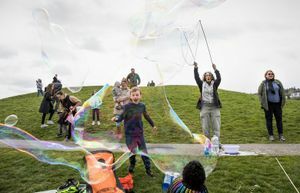 It’s just a patch of barren earth not much wider than a basketball court, but conservationists, government workers and construction managers are pretty fired up about it. The dirt surface spans a bridge structure across Interstate 90 near milepost 61 called an animal overcrossing. For decades, animals have had to contend with heavy traffic on I-90 that has squashed plenty of creatures and cleaved entire populations in two. No longer. 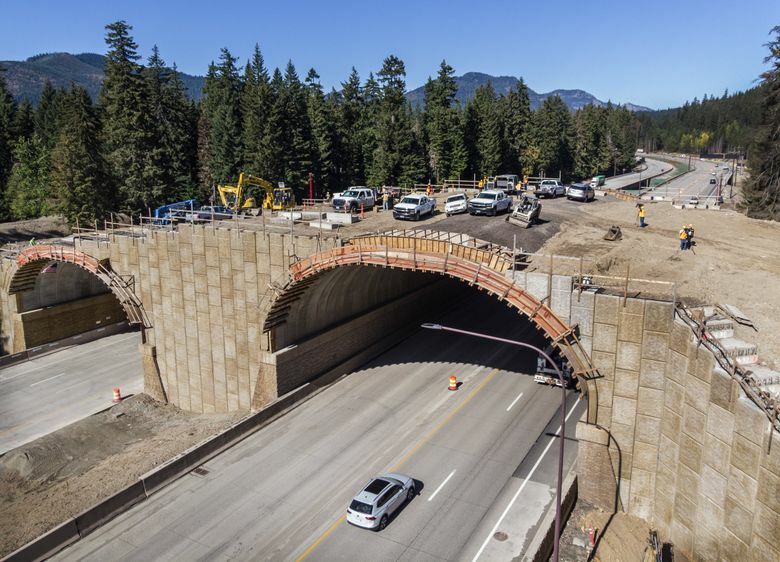 The new $6.2 million overcrossing, which is still under construction near Price Creek, will soon provide safe passage for elk, bears and maybe even mountain goats, as part of an ambitious overhaul of I-90 to reconnect wildlife habitats in the north and south Cascades. Cars pass through two concrete archways underneath. Construction crews completed those archway tubes last year. Workers this summer began placing 5-square-foot panels of concrete and re-bar on the bridge’s two sides and slowly filling it up with dirt. They were careful to distribute the fill evenly, to avoid pressuring the arch and risking collapse. Soon, the workers will raise 8-foot walls on both sides of the 66-foot wide bridge, which should block much of the traffic noise and also prevent snow from sloughing onto the roadway. By fall’s end, the crews will have spread 115,000 cubic yards of dirt over the structure, according to Washington Department of Transportation spokeswoman Meagan Lott. You know those bags of mulch or soil you can buy at hardware stores? That figure is equivalent to more than 1.5 million of them. Next spring, conservationists and volunteers will plant native flora across the span, hoping the plants will make for an inviting destination. They hope to attract smaller creatures like shrews, pocket gophers and terrestrial salamanders to the crossing, too. 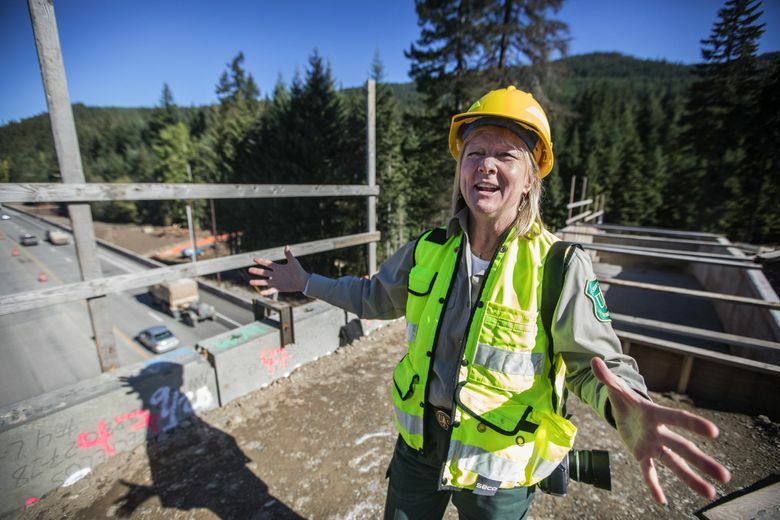 “You’re building a crossing structure for some species and a home for others,” said Jen Watkins, of Conservation Northwest, a nonprofit that has championed the project. 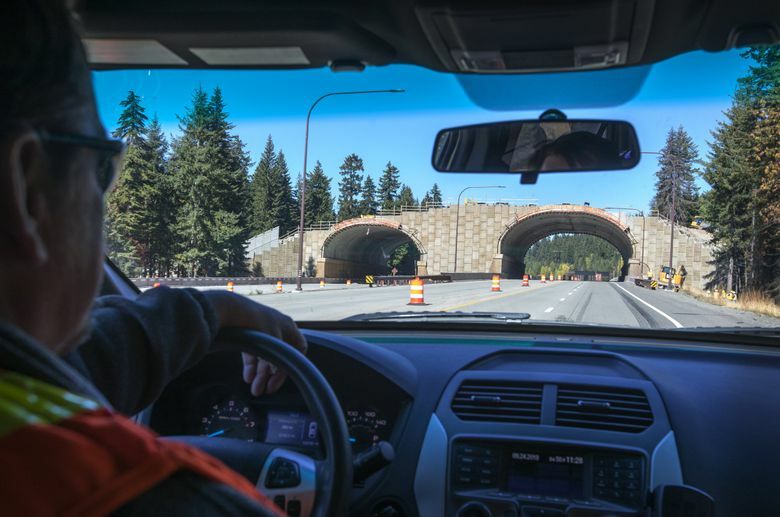 The project is one of more than two dozen wildlife crossings planned or completed as WSDOT manages a more than $900 million overhaul of a 15-mile stretch of highway between Hyak and Easton. So far, the work is about halfway complete. The agency so far has constructed two new avalanche bridges, stabilized rock slopes, replaced several other bridges and widened I-90 from four to six lanes from Hyak to Stampede Pass. By revamping the highway with wildlife’s needs in mind, officials were able to broker an easement with the U.S. Forest Service to add the additional lanes. Three undercrossings can be seen from the animal bridge. For much of the summer, construction workers have been watching two does with fawns cross back and forth beneath the highway. “The crews always take pride in that,” said Phil Larson, a project manager for contractor Atkinson Construction. For the animals, to cross or not is no longer the question. It’s whether to go high or stay low.